Keiji Shinohara was born and raised in Osaka, Japan. After 10 years as an apprentice to the renowned Keiichiro Uesugi in Kyoto, he became a Master Printmaker and moved to the United States. Shinohara’s nature-based abstractions are printed on handmade kozo paper using water-based pigment onto woodblocks in the ukiyo-e style–the traditional Japanese printmaking method dating to 600 CE. Though Shinohara employs ancient methods in creating his woodblock prints, he also diverges from tradition by experimenting with ink application and different materials to add texture to his prints. He personally executes all the steps involved in the printmaking process, from carving the woodblock to printing by hand. Elegantly understated, these works are a fusion of Japanese aesthetic and Western modernism. 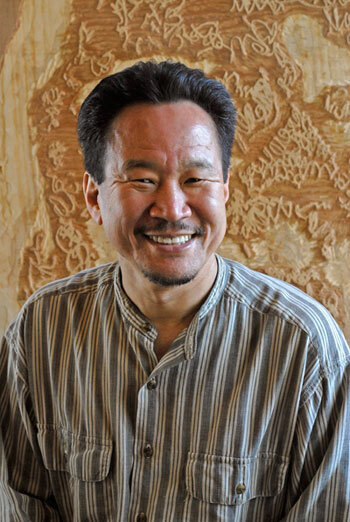 Keiji Shinohara is currently teaching printmaking at Wesleyan University in Middletown, Connecticut and has been a visiting artist at over 100 venues and 30 solo shows. He has received grants from the Japan Foundation and the National Endowment for the Arts and his work is in many public collections, including the Fine Arts Museums of San Francisco, the Cleveland Museum of Art, the Fogg Art Museum at Harvard University, Milwaukee Art Museum, and the Library of Congress.